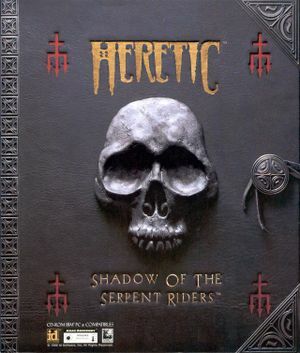 Heretic: Shadow of the Serpent Riders. Configured to run under DOSBox. Although mostly just a shovelware map compilation pack (also containing maps for Hexen), it does contain some original commercial episodes for Heretic (9 single player and 3 multi). The levels include both new enemies (in truth they're just a resin of existing ones) and textures. 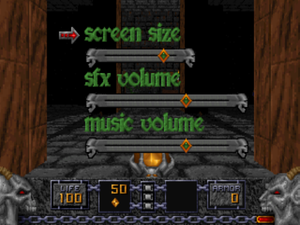 They also converted some of these original levels, "the top 95", to Hexen, though minus the artwork and no longer in episode format (individual levels). This add-on is considered unofficial. 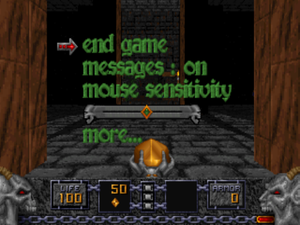 Note that H!ZONE is not compatible with source ports or modern computers due to it using a DOS program to overwrite the base game's data rather than loading as a WAD file; it overwrites episode 3. A fan made remake of the addon for zdoom and derivative is available at this thread. Disable mouse in settings then run this. Source for hack available here. Soundtrack for Heretic recorded on an authentic SC-55 for use with a ZDoom based engine. Choose either OGG or FLAC; MP3 does not support proper looping. The following wads are designed to fix some sort of game data bug or a feature short coming of the game. They do not add any levels/change play style and thus are generally compatible with most user addons. Minor Sprite Fixing Project - Repairs bad sprite offsets and other graphical errors normally encountered when viewing the player and npc sprites. Vanilla (DOS) executable compatible! Widescreen fix - Repairs sprite cutoffs that occur when using certain weapons. Ideal for source ports. A freely redistributable replacement of Heretic-like assets is available at Blasphemer, forming a completely free and open source game. Art assets from the original game such as the levels, sounds, textures, etc., remain under copyright. They can be purchased from Steam or copied from an original game disk. Capped at 35 FPS; for 60+ FPS, see Source ports. Depending on your choice of engine, you can usually change the field of view with a console command, or even in the options. Try fov <1-179> or gr_fov <1-179>. Open heretic.conf with a text editor (ex. Notepad). Set the fulldouble variable to false. ↑ 2.0 2.1 File/folder structure within this directory reflects the path(s) listed for Windows and/or Steam game data (use Wine regedit to access Windows registry paths). Games with Steam Cloud support may store data in ~/.steam/steam/userdata/<user-id>/2390/ in addition to or instead of this directory. The app ID (2390) may differ in some cases. Treat backslashes as forward slashes. See the glossary page for details. This page was last edited on 1 March 2019, at 21:13.